Diet2Go - Fight the fat! The ultimate opponents: your ideal weight and those nasty pounds around your midsection. If you want to emerge victorious you’re going to need willpower as well as a clever game plan when it comes to planning your dietary practices. The question is: what can I continue eating without a second thought and what had I better not scarf down? There are so many questions—who’s going to help you stick to your plan, eat the right thing at the right time, and for once pull this diet thing through? Fight those pounds and read this test! Loosing weight can be so simple, provided you have the necessary will power to step up to the plate and begin your diet. Diet2Go wants to help you stick to your resolution and provides you with entire weeks’ worth of meal plans that you can quite comfortably carry around in your pocket. 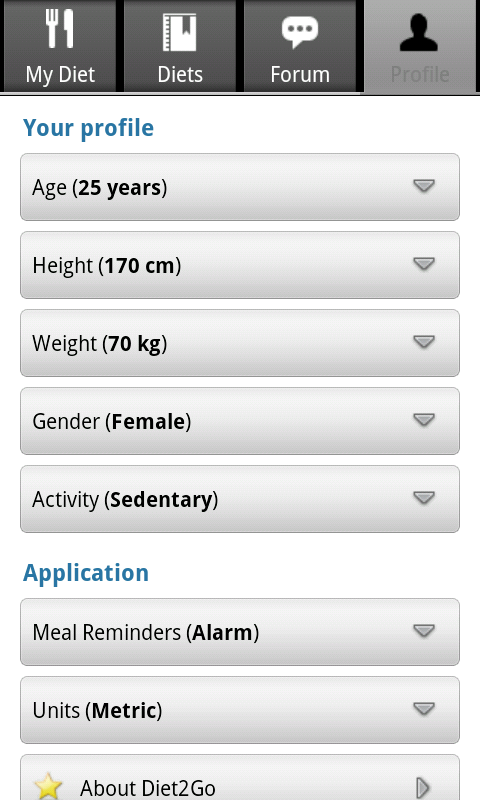 At the moment the profile is meant only for you to use; it doesn’t seem to have any other functions (e.g. weight statistics or other fun facts that could be generated using this data). Have you selected one? Okay, then let’s get cracking, because what’s to come is pretty awesome. Diet2Go provides full meals plans including breakfast, lunch, and dinner. There are even suggestions for snacks, such as a yummy apple when you’re feeling peckish. So you have your meals all planned out, but which groceries will you need to prepare each meal? Diet2Go provides you with this information as well: not only does it list which ingredients are needed, it prepares a shopping list for you, in the preferred check box style where you can tick things off as you buy them. You can set a reminder for your daily meals so that you’re sure not to forget what’s most important in life: food. Choose whether you want the alarm sound to go off or if the vibration function will do. To make sure that Meal Reminder lets you know when to eat what at the right time you can set times for each of your meals. 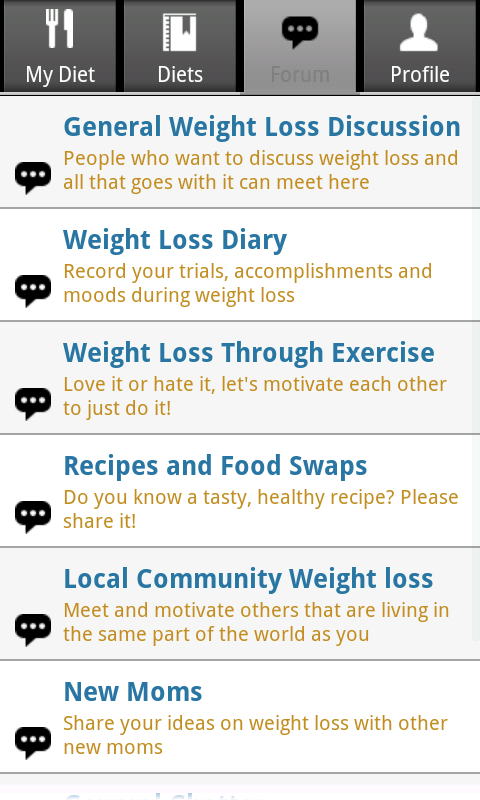 Motivation is key when you start a diet, which is why Diet2Go has an active forum that you can use to discuss your plight with others. 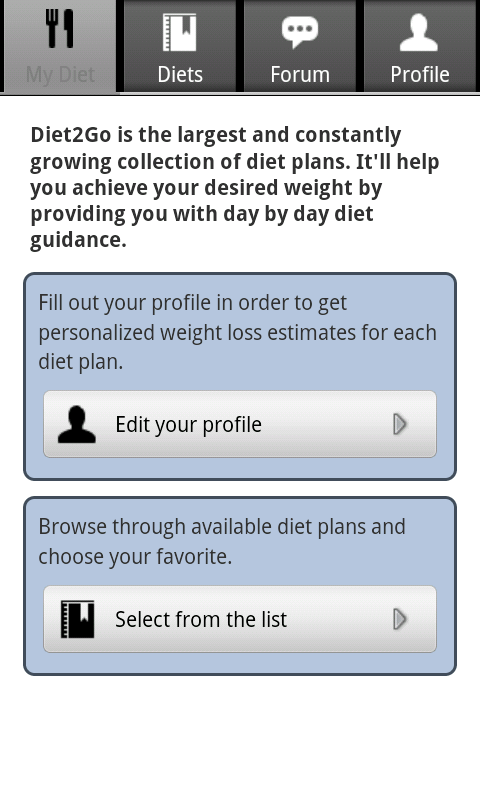 There are threads dealing with weight diaries, recipes, diet groups, and more. If you happen to be a social networking guru you can use your skills in order to share your personal diet plan with others by tweeting or posting it. “Chew your food longer. This will allow you to appreciate your food more and you will feel full faster.” These are the types of recommendations and tips you’ll find on Diet2Go. The app is in English only. The app’s design is simple so that you can focus on what’s most important. There are four tabs in the upper half of the screen that allow you to navigate. Quick and easy to use. You won’t feel the need to click on the menu button very often as all the most important information is displayed on the screen. Diet2Go ran very smoothly throughout testing phase; no crashes! 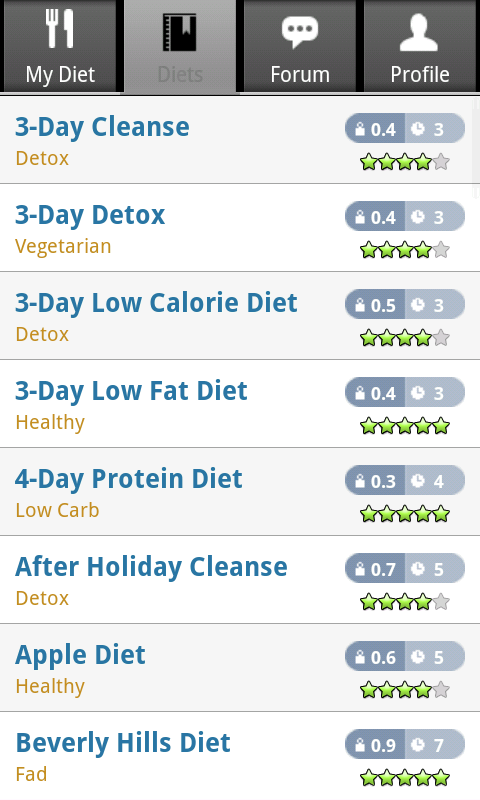 You can download Diet2Go free of charge from the Android Market.